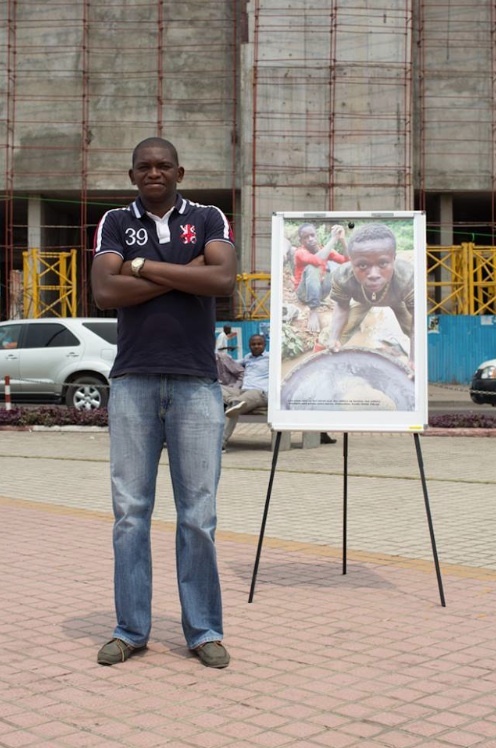 From “Humans of New York” album: For many people in the US, the most common vision of Africa is the depictions of starving children which are wrenching but give a narrow view of that vast continent. Many think Africa is a country; many are surprised to hear African countries have cities, that people wear tee-shirts & blue jeans & not grass skirts, have rich cultures & immense artistic & cultural achievements. If American school kids were taught the truth about Africa they might begin to question the baloney that passes for Black history in the US. And that might give them a whole new take on news from Ferguson. Neoliberal colonialism is advancing in African countries led by the US, Canada, India, China, Israel, France, the UK, & other regimes. They make devil’s deals with corrupt African regimes to outright steal natural resources & impoverish millions who are then forced to immigrate. AFRICOM is the NATO-like military apparatus set up by the US to force compliance with colonial plunder & it is already operational in several countries. It seems certain the crescendoing alarmism about Islamic jihadism is the propaganda face of US military aggression not just in the Middle East but in Southeast Asia, & Africa. We need to inform ourselves so as not to be hoodwinked by stink tank lies. This young immigrant in New York puts his finger on the problem with the pictures of starving babies because formerly whole generations of Blacks in the US only knew slavery as their history. If they had been taught about Nubia or any of the other great civilizations of Africa they wouldn’t have had to plow through life with racist impedimenta. Though even the ugly encumbrance of false history could not hold back the tsunami of the Civil Rights & Black Power Movements. 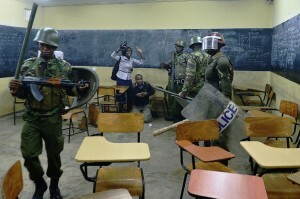 This is another photo of a student in Nairobi, Kenya protesting education fee increases. He is attempting to escape a classroom where he & other students were cornered by riot cops lobbing tear gas canisters. This guy looks a lot more bookish than rowdy, as the riot cops claimed to justify their assault on unarmed student protestors. Our fullest solidarity with him & his fellow protestors. May they use their education to upend the system of exploitation that prevails across this globe. What else is learning for if not to make this world a better place? Police brutality against peaceful protestors is now the norm in almost every country as resistance grows to austerity measures. Education & pensions are primary targets in the cutbacks so seniors & students often take the brunt of police violence. Media reports attempt to make students fighting pitched battles with riot cops appear to be the aggressors. They use catch phrases like “protests turned violent”,” “violence erupted” to disguise that fully-equipped riot cops are attacking unarmed, defenseless students with grenades, tear gas, truncheons, water cannons, & often live ammo. Students are accused of using deadly force by hurling rocks. You’d think machista cops would be embarrassed by such claims. Protestors actually do have a weapon that’s quite fatal to deceit: the camera, which puts the lie to police claims they were threatened by violent hordes of students. The case in point today is public university students in Nairobi, Kenya, protesting an increase in student fees that would force many of them out of school. Young people can get quite testy when they’re denied an education but their protest was reportedly entirely peaceful. Police officials told the ever-gullible media that things turned sour when protestors started blocking traffic, robbing tourists, looting shops & forcing them to close. 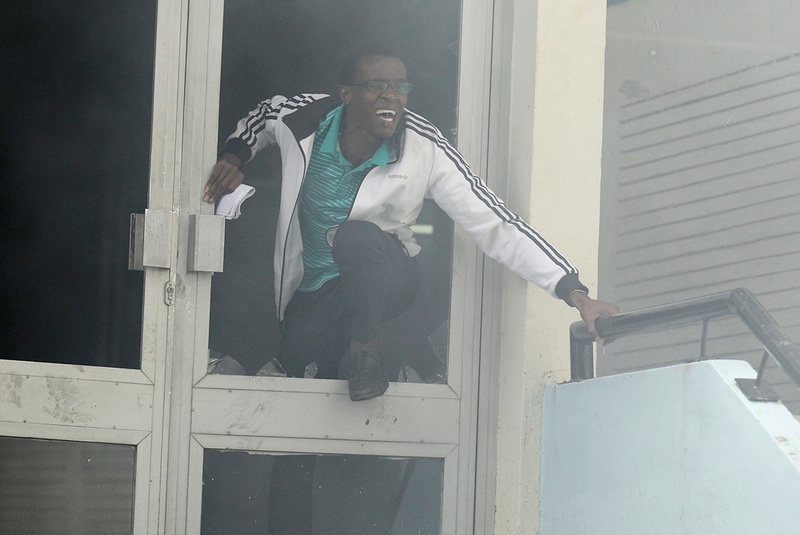 Now all this alleged disruption took place in Nairobi’s central business district though there isn’t a single piece of documentation–not even a single photo of an anarchist ripping the place apart. The media doesn’t explain why cops didn’t attempt to stop the rowdies on the spot but instead stormed the main campus of the University of Nairobi wielding truncheons, lobbing tear gas canisters, & pointing guns with live ammo at unarmed students. Here’s where the deadly weapon of the camera comes in: many photos show riot cops chasing students into campus buildings, cornering them in classrooms & inundating them with tear gas, standing over cowering students with batons. Students are crying & cringing in fear, overcome with tear gas, shown being assaulted, shown trying to escape police violence & tear gas by crawling through broken windows. Reportedly, 100 students were arrested; to compensate for police & media lies, you’ll need to multiply that. Now a question remains: how did riot cops reduce rowdies to cowering & crying? If it’s so effective, this police formula should be bottled for police departments everywhere. Except it didn’t happen as police officials & media report it. Like everywhere else, police attacked peaceful demonstrators who were exercising their democratic rights to protest & defend their access to public education. Government officials in Kenya say students jumped the gun since there is no announced education fee increase. Christine Lagarde, the noose-bearer of the IMF, has been hanging out in Kenya recently so students were engaging in a preemptive strike just to let the regime know they would not be patsies in the austerity measures mandated by the IMF. Our fullest respect & solidarity with the striking students of Kenya in their fight for education.